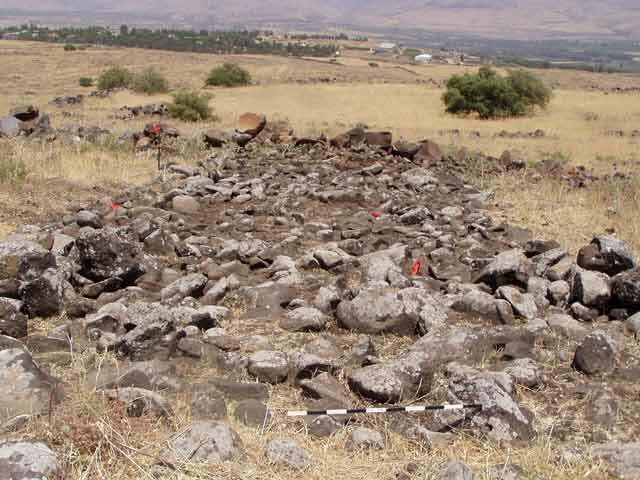 During May–June 2004, a small-scale salvage excavation was conducted along the route of an ancient road at Umm el-Kalkha, north of Moshav Amnun (Permit No. A-4176; map ref. 25493/75729), after mechanical equipment damaged a section of the road. The excavation, undertaken on behalf of the Israel Antiquities Authority and underwritten by the Ashtrom-Dragados Company, was directed by Y. Stepansky (photography), with the assistance of Y. Ya‘aqobi (administration), A. Shapiro (GPS) and A. Hajian (surveying). The road, referred to in the literature as “The Way through Korazim”, crosses the Korazim plateau from west to east, after branching off from the main Cairo–Damascus road, which ascends to the northeast toward the Benot Ya‘aqov Bridge (Y. Stepansky 2002. Ramat Korazim. In G. Barkay and A. Schiller [eds]. The Upper Eastern Galilee and Ramat Korazim [Ariel 154]. Jerusalem. Pp. 15–17; ESI 9:14–16; ESI 16:30–32). The course of the road is visible from the vicinity of Khan Jubb Yusef in the west, near Qibbuz Amiad, for a distance of more than 7 km to as far as Moshav Almagor, on the way to the Bet Zeida Valley in the east (Figs. 1, 2). The course of the road in its western part runs north of Moshav Korazim, crosses ancient Korazim, and continues along the route of the modern road until the Amnun Junction, where it continues descending in a straight line toward Nahal Koah, along a gentle but rocky slope. The road crosses Nahal Koah and Nahal Or via stone-built bridges whose remains can still be seen in the area. The road, along the slope between the Amnun Junction and Nahal Koah, was damaged by mechanical equipment. The damaged section, as well as a 25 m long segment of the road, which extends west of the section, were cleaned during the excavation. An area (L1; 2 × 5 m, depth 0.5 m; Fig. 3) close to the eastern end of the segment and two small areas along the shoulder of the road (L3, L5), which yielded no finds, were excavated. 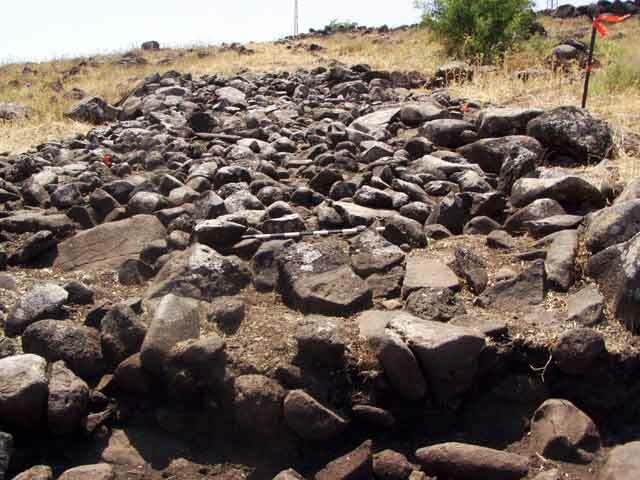 The roadbed (thickness 0.4–0.5 m), built of one or two courses of small and medium basalt stones mixed with soil, was the only surviving element of the road (average width 4 m; Fig. 4). The stones were filling the empty spaces between the protruding bedrock and the larger basalt stones that lay on the surface. One may assume that prior to paving the road the very large stones were removed from the planned route. The road was bordered by curbstones that survived in several places to a height of three courses. In all likelihood, the roadbed was covered with a layer of packed and leveled soil that facilitated the movement of pack animals and wagons. Several potsherds dating to the Roman or Byzantine periods and one fragment from Middle Bronze Age II were found in the fill of the roadbed. The meager finds do not enable us to determine when the road was paved or the duration of its use .Z. Ilan had suggested in the past that the road was paved in the Roman period, when other roads were built in the Galilee (ESI 9:16). However, the construction method is uncharacteristic of the Roman period and its quality is inferior to that of the Roman and somewhat later roads, such as the ‘Akko–Zippori–Tiberias road, whose sections have been studied near the Golani Junction (HA-ESI 114:22*). Therefore, the road should probably be dated to the Mamluk period, possibly to the time of Sultan Baybers (thirteenth century CE), when rapid mail routes were prepared in the country for horse riding, to link Egypt with Syria (Y. Tepper and Y. Tepper 2003. 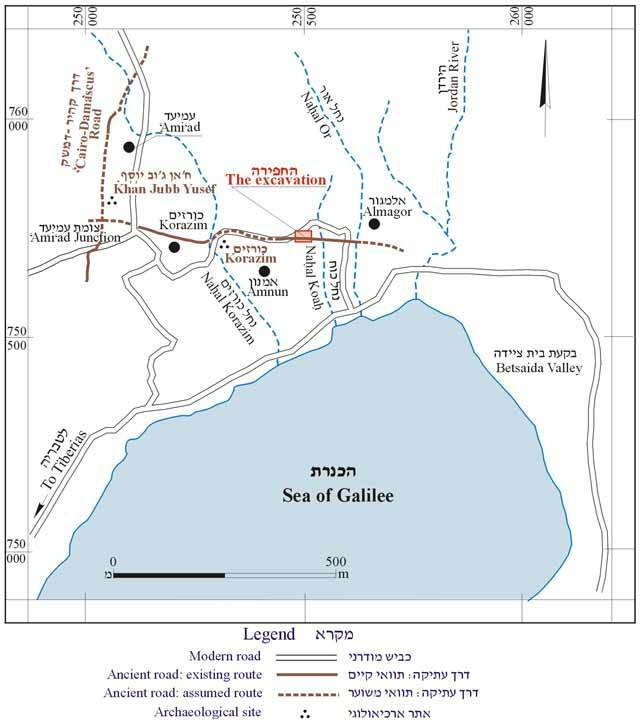 The Barid of Horse Couriers from the Time of Baybars: A Description of the Road in the Lower Eastern Galilee and the Golan and a Historical Discussion. Jerusalem and the Land of Israel 1:123–152), or possibly to the fourteenth–fifteenth centuries when Khan Jubb Yusef was built. 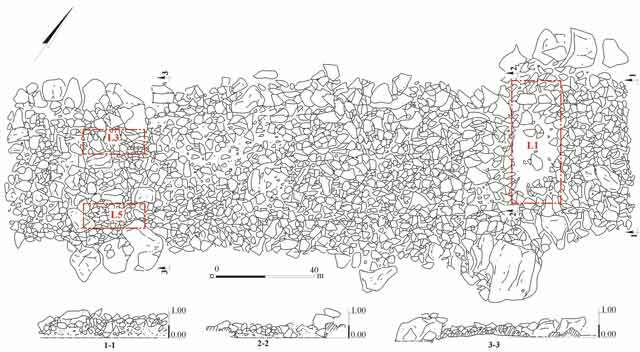 It is also possible that the road was paved only in the Ottoman period, along with the construction of the stone bridges, as evidenced by the Ottoman-period building style of small dressed basalt stones that may be observed at the Nahal Koah bridge (ESI 16:31, Fig. 32). 2. The road, general view to the east; Moshav Almagor in background. 3. The road, plan and sections. 4. The road, looking west.